← Beware the Overachiever – David Kahn, et al. With the upcoming ACC-B1G Challenge’s pairings to be announced this week, we decided to interview SB Nation’s Big Ten Basketball blog, BT Powerhouse. We wanted to do a quick overview of the event and our wish list for potential matchups, but wanted to get a B1G’s perspective. Our questions and their answers below. Our answers to their questions are HERE. Every Month March : After the ACC won the first ten Challenges, the Big Ten has broken through these past 2 years and taken the title. Why did it take so long for the Big Ten to break through? The Big Ten’s had some great teams in the early part of the decade so was it just bad luck and tough matchups? Did the ACC expansion and recent coaching turnover help break the trend these past couple of years? BT Powerhouse : The Big Ten has always had a tough time with the ACC. The Big Ten has been thrown in tough match ups year in and year out. It is true that the Big Ten has some great teams early in the decade but, the rest of the Big Ten wasn’t great. In the last couple years it has been that case in the ACC, there are a couple great teams and the rest of the ACC is weak. The ACC and Big Ten swapped places in that retrospect the last two years. EMM : Looking ahead to next year’s potential matchups, what would your top couple of dream matchups be? Put yourself in charge of the schedule. No rotating schedules. No rules or restrictions. You choose who, what, when, where, etc. Anything goes. BTP : Next year, my two dream match ups would be North Carolina at Ohio State and Duke at Purdue. North Carolina at Ohio State would be interesting because they are two young teams who are very much on the rise. It would be definitely be a show. I would also like to see Duke at Purdue because Purdue has had a history of getting beat by Duke as of late. It seems like Duke knocks them out every time they play. With Purdue’s Robbie Hummel finally coming back to the hardwood, it would be interesting to see him take out his anger on Duke one more time on his home floor as he would try one last time to beat the Blue Devils. EMM : What would be the best individual matchups to watch next year in perfect Challenge? Jared Sullinger going up against the Carolina front court has to be on the top of your list right? BTP : Jared Sullinger against the UNC front court is at the top of my list. It would be interesting to see what Jared Sullinger could do against them. Also, I would like to see how a Big Ten defense handles that UNC front court. My other top individual match up would be Purdue’s Robbie Hummel against Duke’s Plumlee twins. 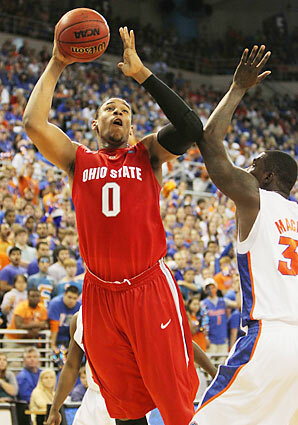 Sullinger against the Carolina frontcourt would be must-see TV. EMM : The other BCS conferences all piggybacked off the Challenge and created their own versions. If you had to replace the ACC as the Big Ten’s counterpart for the next 10 years, which conference would you choose and why? BTP : I would pick the Big East because Big Ten fans are always given a hard time by Big East fans. The last couple years the Big Ten has been expected to be the best conference in the country at the beginning of the year and the Big East has overtaken us, as far as rankings go. To see us finally battle it out for a true champion, would be a sight. EMM : Last one, give us your prediction of what the pairings will be? And give us a waaaaaaay too early prediction for each matchup? **Update**- I didn’t see that the B1G released the home teams a month ago. Michigan and Indiana will be on the road again while Nebraska and Minnesota will have home games. Sorry for the mistake. EMM: Big thanks to BT Powerhouse! We’re already looking forward to next year’s Challenge.